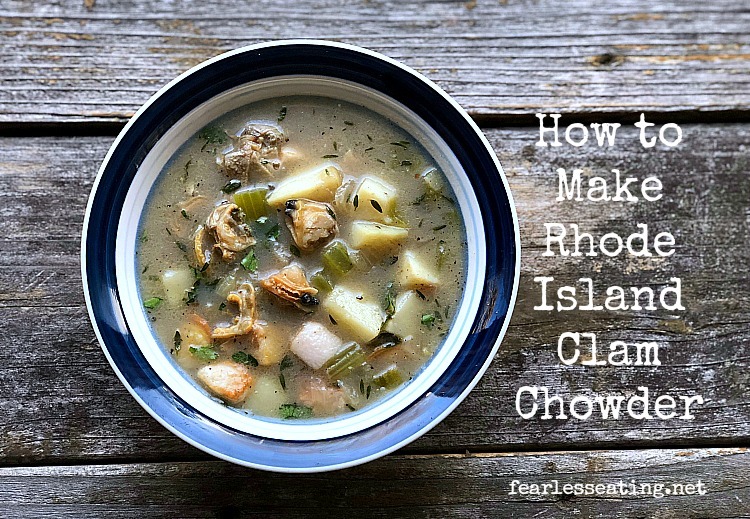 Have you ever heard of a Rhode Island clam chowder? Unless you live in Rhode Island (and the chances of that are about as small as Rhode Island), I’m going to say probably not. After making it this past weekend, I have to say that Rhode Island clam chowder is a pretty spectacularicious (yes, spectacularicious) thing. 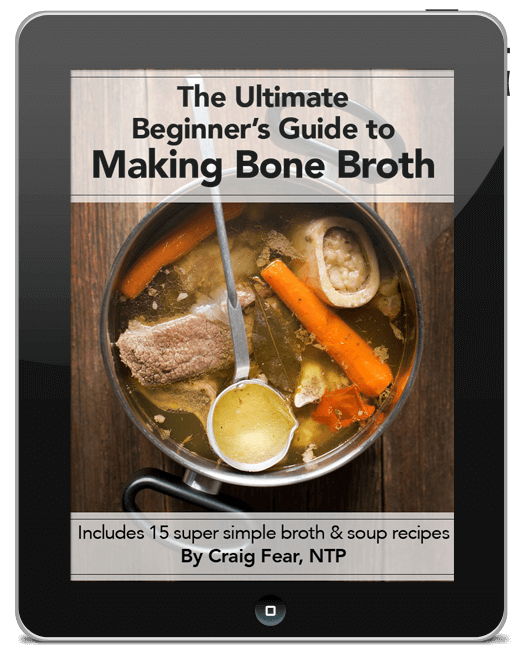 Its defining characteristic is that it’s made with a clear broth which means it’s dairy-free. Furthermore, there’s no use of flour to thicken the chowder, a common ingredient in many chowder recipes, so it’s also gluten-free too. I stumbled upon Rhode Island clam chowder somewhat serendipitously. 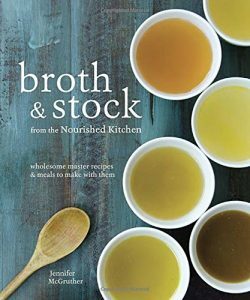 I was looking for a unique chowder recipe in Broth and Stock, a great cookbook by Jenny McGruther of Nourished Kitchen. I thought for sure I wouldn’t find any chowder recipes but I decided to give it a quick scan anyway, just in case. I opened the book and the first recipe I came upon was Rhode Island clam chowder. Even more telling, the base of the recipe was fish broth, my absolute favorite broth, and I’d just made a few quarts of fish broth. Now you can certainly make this recipe with a clam broth too and I actually decided to make two pots of it, one with clam broth and one with fish broth, and compare the results. I also wanted to use fresh clams as opposed to canned clams because right now is peak clam season here in the northeast. That’s right, they’re at their most juicy and tender in the middle of winter! That would be Quahogs or Cherry Stones. In fact, Quahogs are also known as “chowder clams” because they are the largest of the hard shell clams and are ideal for using in chowders. 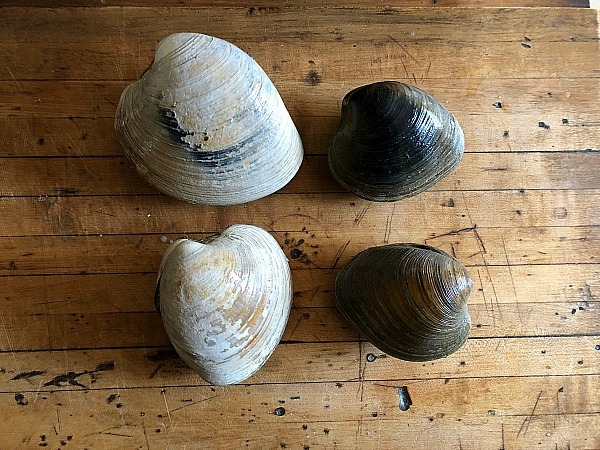 Other types of hard shell clams are technically also Quahogs (Quahogs are a species of hard shell clam), though they’re named based on their size. Cherry Stone clams are the second largest while Little Necks are the smallest. Those are Quahogs on the left and Cherry Stones on the right. I got about five pounds total which yielded about 2 cups of clam meat. I’ve always said fish broth is the easiest broth to make because it only takes an hour. You can see how to make it here. But clam broth is even easier. For about 5 pounds of clams, add the clams and 1 quart of water to a large stock pot. Simply bring the water to a boil, reduce the heat and simmer for about 10 minutes until the shells open. The juice (also called the “liquor”) inside the shells, will infuse the water with a wonderful, briny flavor. Strain the broth to remove any dirt or sand and voila, you’ve made clam broth. You can also buy clam broth, also called “clam juice”, in stores but if you’re going to use fresh clams, there’s no need to buy clam juice. As I said above, I made two pots of Rhode Island clam chowder, one with clam broth and one with fish broth. Personally, I liked the fish broth version a little better. It had a more rounded broth flavor from the vegetables and herbs and it wasn’t quite as briny as the clam broth. But the clam broth was certainly good too. Either way, you can’t go wrong! Traditionally, most chowder recipes used salt pork, which is fattier and saltier than bacon. Of course, these days, bacon is a lot easier to find and most recipes use bacon instead. That’s totally fine but I think salt pork works a little better because it’s not as intense of a flavor. 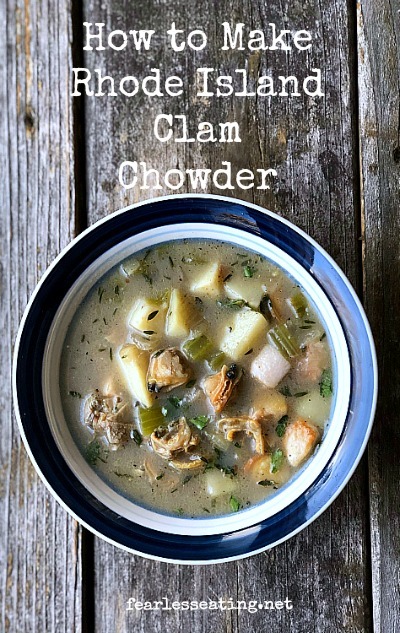 For me personally, what makes Rhode Island clam chowder so spectacularicious is the broth! As much as I love bacon, I don’t want it to overwhelm the broth, which it can easily do. 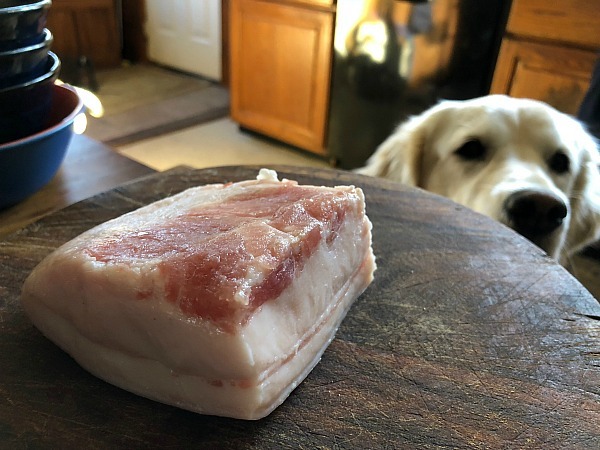 That’s a piece of salt pork. Lipton was a big fan, to say the least. It may not be easy to find in supermarkets. In that case, try to get a nice fatty piece of slab bacon, instead of individual strips of bacon. The fat will render and create a nice cooking fat for the veggies in the first part of the recipe below. 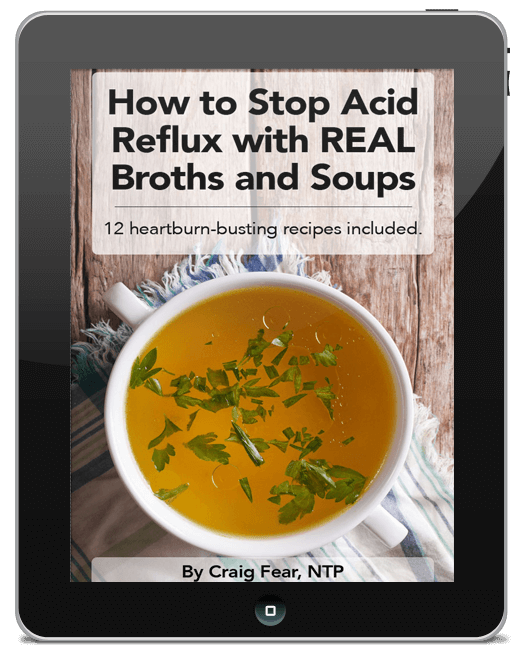 Finally, my recipe is adapted from the recipe in Broth and Stock which contains lots of awesome recipes for homemade broths and some wonderful homemade soups too. It also includes some great seafood broths too such as fish stock, dashi, shellfish stock, and a sea vegetable broth. And it has a great chapter on seafood-based soups including recipes for New England clam chowder, seafood stew with a lemon parsley pesto and a tom yum goong (a Thai-style spicy prawn soup). Dairy-free and wonderfully brothy and briny, this recipe is a great alternative to the more common cream and tomato-based chowders. Clean clams of dirt and sand. Scrub under running water and then place in a bowl and cover with water and let sit for 10-15 minutes. Drain and rinse clams. Repeat if necessary. To make clam broth, place clams in a large stock pot and add 1 quart of water. Bring to a boil, reduce heat to a simmer and cook about 10 minutes until shells have opened. Strain broth through a cheesecloth lined fine mesh strainer and set aside. Remove clams from shells and set aside. Add salt pork to stock pot and cook over medium heat, about 5-7 minutes, stirring ocassionally, until fat renders out. Remove when crisp and browned. If using bacon, melt butter first, then add bacon to butter and cook until bacon browns, about 5-7 minutes, and remove. Careful not to burn either salt pork or bacon. Add onion and celery to pork fat and saute about 5 minutes until softened. Add broth, thyme, bay leaves and potatoes. Bring broth to a rolling boil, reduce heat and simmer, covered, about 10 minutes, until potatoes are cooked through. While soup is simmering, chop clams into small, bite-sized pieces. When potatoes are cooked, add clams and simmer for another minute. Remove thyme sprigs and bay leaves. Taste and season to taste with salt and pepper. Ladle into individual bowls and top with chopped parsley, to taste.